Catalog Page 59 - Christmas Scarf and Santa Hat, Bandanas, collars and football caps. 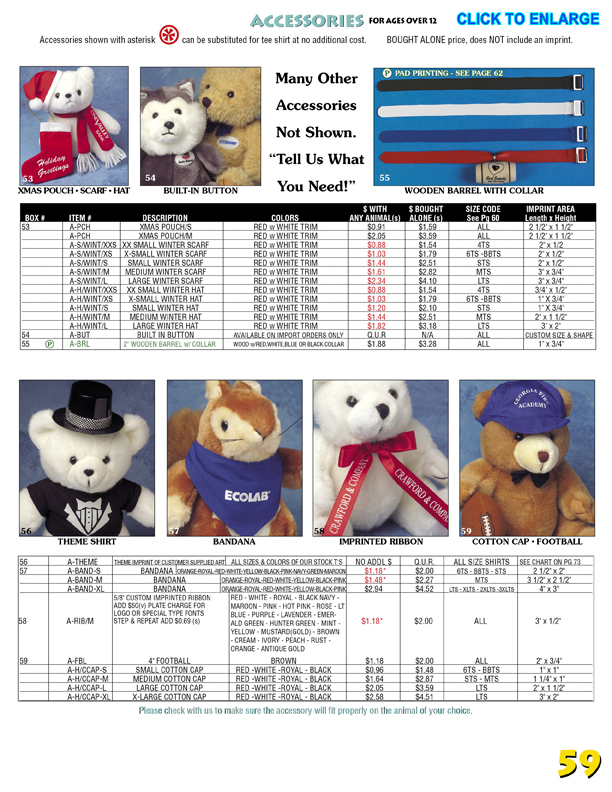 Catalog Page 59 offers accessories for teddy bears and plush toys. Included are Santa hat, Christmas stocking and scarf, printed ribbon, bandanas, tuxedo t-shirt, football and cap, wooden barrel and collar and built in buttons. The red colored price is the price when purchased with a stuffed animal. Printed ribbon has a minimum or 160 pieces. Most other items have a printed minimum of 24 pieces.